The most important thing to know in sales. The reasons to Hire Employees. 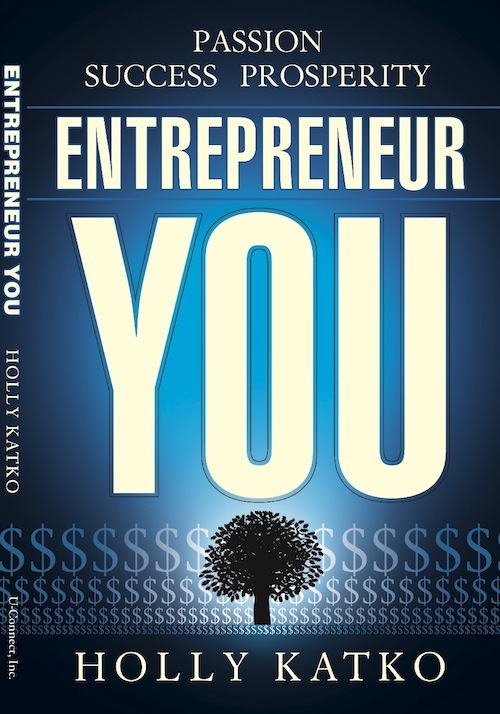 Holly Katko, the author, was born and raised with an entrepreneurial spirit, and in the year 2000, she took the plunge and formed her own successful business, U-Connect. She now shares what she learned from this experience along with her previous 25 years in management. 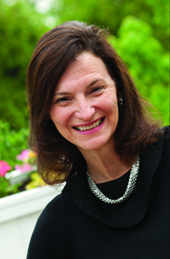 Holly is a well-known and sought-after keynote speaker, corporate trainer and expert on entrepreneurship. 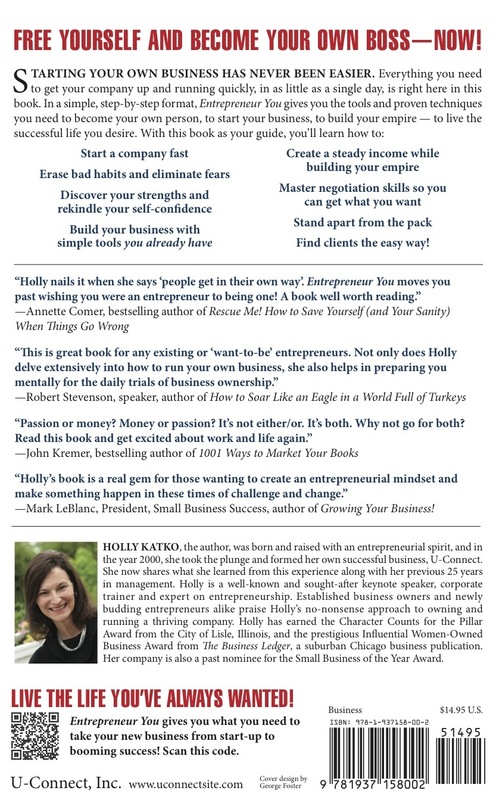 Established business owners and newly budding entrepreneurs alike praise Holly’s no-nonsense approach to owning and running a thriving company. Holly has earned the Character Counts for the Pillar Award from the City of Lisle, Illinois, and the prestigious Influential Women-Owned Business Award from The Business Ledger, a suburban Chicago business publication. Her company is also a past nominee for the Small Business of the Year Award. Starting your own business has never been easier. Everything you need to get your company up and running quickly, in as little as a single day, is right here in this book. In a simple, step-by-step format, Entrepreneur You gives you the tools and proven techniques you need to become your own person, to start your business, to build your empire – to live the dream! Free Yourself and become Your Own Boss – Now! Find clients the easy way! Mark LeBlanc, President, Small Business Success, author of Growing Your Business! Question: Let’s get a brief description of what U-Connect is? Answer: We have been in business for 11 years. Our job is to help people find their passions. I do keynote speaking and help corporations and individuals by developing soft skills programs for companies. Whether it’s over-coming fear or management skills or whatever it might be to help people to the next level in their lives. Question: You’ve taken a big step and you have put out a book. It’s a big accomplishment and you have put in your book all that you know and all that good stuff which actually puts U-Connect in book form! Tell me a little bit about the book. What made you build the book? Answer: The book was an absolute inspiration. I was running in the Arboretum one day and as I was running I was thinking to myself “What is it I really want to do in life”. And all of a sudden it just hit me like a jolt. I realized I wanted to help people take control of their own lives. To me that means entrepreneurship, to actually own your own company and do what you do best. So that’s where it came from. Question: I believe entrepreneurship is on the rise and people want to take care of their own financial well-being. So tell me a little bit about what sets this book apart from other entrepreneurial books? Answer: It’s not one of those books that are a real self-help book as much as it’s helping the entrepreneur take the first steps in starting their own company. When I started my own company 11 years ago I found it was a matter of just taking that first step and every time I would try to take that first step something would stop me…a little thing here or there that would stop me. So my purpose in developing this book is to help people take that first step in starting and owning their own businesses. That’s what sets the book apart. We also help people with the steps of change how to actually go through this change and then identify what you want to do in your company. A lot of people don’t know what they want to do when they are going to start their own companies. Do you go with what your passion is or do you go with something that’s going to make you money and how do you take those two things and bring them together and also make money doing so. Because really without money, you won’t get too far. Question: It’s the trick to find out what’s going to work to be an entrepreneur. Especially since you might have worked all your life for someone else and now you are going to be your own boss. You’re talking about change tell me more about that. Answer: Yes it’s change and also obtaining the self-confidence that you need and overcoming fear and understanding fear which is really just a lack of self-confidence and understanding where that fear is coming from and how to eliminate it. Question: When you say fear. Fear of what? Answer: Fear of change. Fear of starting something new. Fear of owning your own company. Fear of what’s going to happen with your mortgage, what’s going to happen to your children. Are you able to take care of everything in your life as you build your own company? We help people overcome this fear and understand the end result is well worth it. Question: That’s exciting and you decided to put this out in book format. Where will it be available? Answer: It will be available everywhere in book stores, Amazon, Barnes and Noble as well as in eBook form and workshops we are performing across the nation. Question: It’s one thing to be a public speaker and it’s another thing to put your thoughts down on paper. And organize it. Was this difficult? Answer: Yes very much so. I struggled with how to start the book and then I realized as I continued to build out my seminars that I was actually building the book. After a year of building new seminars on topics that concerned me, that I needed help with, I realized I was building the book through my speaking. Question: You say on the front of your book Passion, Success and Prosperity. I hear passion from you a lot. I don’t think people often think of entrepreneurship and passion. But you bring them together. Tell me how? Answer: Yes. Passion is critical. One of the important things to understand is you may find a product that you want to venture into and you think, well it’s really not my passion. Don’t dismiss it because you think your passion is not in it. The product or service has been put in front of you for a reason. As you dig deeper you may find your passion is within that product or service you are providing. Don’t be afraid of taking that step. If something is put in your path – do it. Just do it. Take action and make it happen. This is the biggest problem that people have. They don’t take the action they need to get to the next level in their lives. They stop, they hesitate, next thing it’s gone and they don’t go any further. They need to push forward and make it happen. If that product or service doesn’t make it – so what your entrepreneur – you can do anything you want in life. All you have to do it take the step. Question: I think we hesitate taking the step because we don’t know if it’s the right decision or not, but what you are saying is move forward because it is better to do something instead of doing nothing..
Answer: Exactly right – you need to take those steps. Question: How did this all come to be for you. You’ve had this business for 11 years. But how did you put it all together and build your passion into it. Answer: One year – I turned 40 – mile stones help – I decided – I’m going to do this. Or I could wait another five years, or another, five years or another five years until there were no more years left. Then what do I have. So for me it was important to take action and do it now. And one of the things I really want to point out is it’s not when your 40. Do it when you’re in high school, do it when you’re in college. I wish I had not waited until I was 40 – why didn’t I start my company earlier? I want to help others do just that. Question: Even business people should look at this book because it’s about passion and doing it. Answer: Absolutely! Even if you are working for a large company. Entrepreneurism doesn’t happen only when you own your own company, but also when you’re in corporate America. If you act as though you own your own company, as if the company you are working for is yours, you will succeed much easier. This was one of the keys I used when I worked for corporate America. If I treated the company as my own a promotion was always around the corner. Media: Contact author for interviews or review copies. Visit www.uconnectsite.com. The book retails for $14.95.